This colorized view is part of a panorama produced by Ken Kremer and Marco Di Lorenzo from NASA imagery. The picture shows NASA's Curiosity rover putting its drill to work at Yellowknife Bay on Mars. Click on the picture to see a larger version, and visit KenKremer.com for more from Ken Kremer. Even as the scientists behind NASA's Curiosity rover mission announced that they found evidence of life-friendly chemistry inside a Martian rock, the $2.5 billion mission's engineers continued their efforts to get the rover back into full operation after a serious computer glitch. The rover's scientific work in a spot known as Yellowknife Bay has been put on hold while the mission operations team rebuilds the memory for one of Curiosity's two redundant computers, known as the A-side. The A-side computer experienced a memory failure on Feb. 28, forcing controllers to switch over to the B-side backup brain. Since then, the team has been putting the A-side through a series of tests to make sure it's OK.
"We have been able to store new data in many of the memory locations previously affected and believe more runs will demonstrate more memory is available," Jim Erickson, the mission's deputy project manager at NASA's Jet Propulsion Laboratory, said Monday in a status report. A couple of software patches are due to be uploaded and tested this week, and then the team will reassess when to resume full mission operations, including the analysis of additional rock samples. Engineers still don't know why the A-side failed, although they suspect it may have been due to a cosmic-ray hit. Such hits are thought to have affected Mars Reconnaissance Orbiter in the past. After the computer system returns to full redundant mode, the B-side will continue to operate as Curiosity's main computer while the A-side serves as backup, NASA spokesman Guy Webster told NBC News on Wednesday. Mars is heading into a solar conjunction in April that will interfere with communications between Curiosity and Mission Control, and science operations will have to be suspended again during that hiatus. That means the rover won't drill out another sample of rock powder from Yellowknife Bay until May. Scientists say Yellowknife Bay could have been a riverbed or lake bed in ancient times — just the right kind of place for figuring out what Mars was like billions of years ago. "I have an image now of possibly a lake, a freshwater lake on a Mars with probably a thicker atmosphere, maybe a snow-capped Mount Sharp. Who knows?" said John Grunsfeld, NASA's associate administrator for the science mission directorate. Curiosity's science team members are so intrigued by what they've been finding that they're willing to go slow with the rover's long-planned trip to Mount Sharp, a 3-mile-high (5-kilometer-high) peak in the middle of Mars' Gale Crater. The layers of rock that make up that mountain, also known as Aeolis Mons, are thought to preserve Mars' geological record over billions of years. "When we start driving to Mount Sharp, and you see us dragging our feet as we go along there and stop to look at a few things, that's because we'll be trying to figure out how the rocks we're at now, at Yellowknife Bay, relate to Mount Sharp," said Caltech's John Grotzinger, the mission's project scientist. 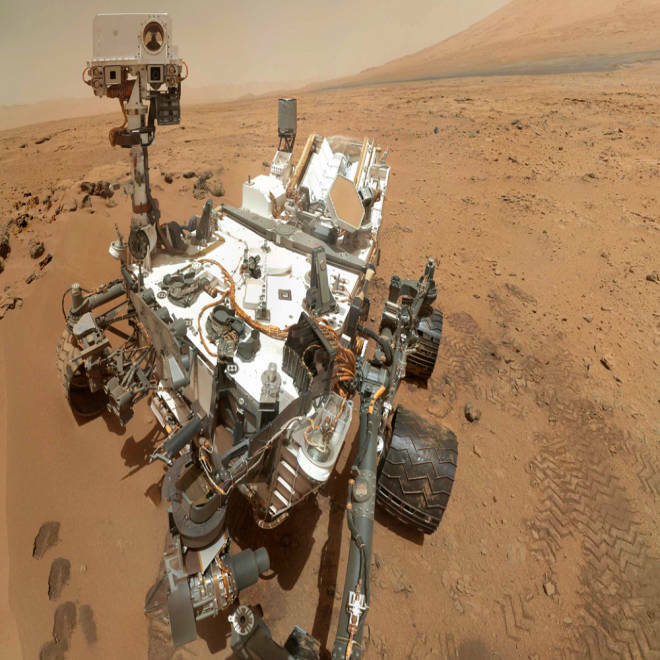 Extra credit: The Mars Curiosity crew is coming in for more accolades. The Mars Science Laboratory Project, which is in charge of building and operating the rover, has been selected to receive the National Air and Space Museum's Trophy for Current Achievement at a ceremony next month. 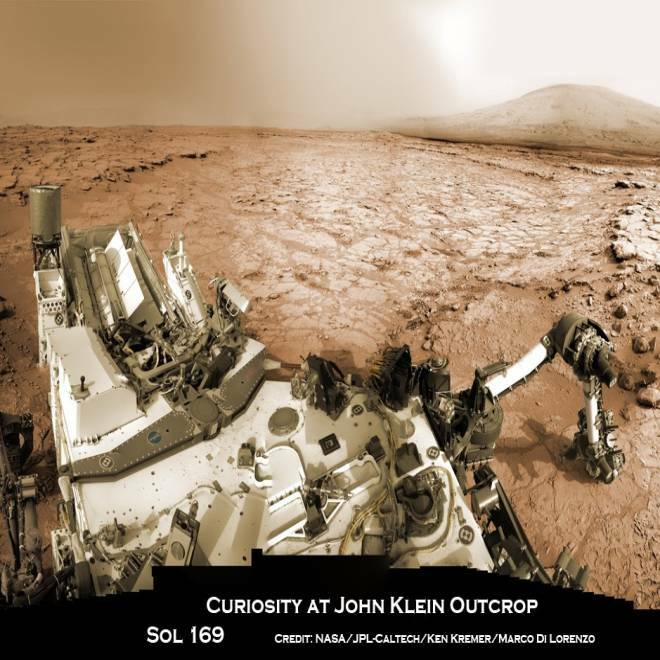 Meanwhile, the folks who manage Mars Curiosity's online persona have won the 2013 South by Southwest Interactive Award for best social media campaign. Congratulations to the "hive mind" behind @MarsCuriosity on Twitter. Organics found, but are they from Mars?